Health and Safety in the workplace is an important area of business efficiency, professionalism and success. Companies must comply with rules and regulations to ensure a healthy and safe working environment for their employees. Training and courses keep staff up-to-date and protected from injuries and accidents. Browse the list of health and safety courses below and complete information requests for any that may be of interest to you. Health and Safety compliance is not only the law, but is necessary in order for businesses to be efficient, productive and successful. Employees that are happy, healthy and feel safe in their working environment work more effectively, than those not protected from injury or accidents. Depending on the industry, the working environment will be different, thus there is no general rule for all businesses to follow - and risk assessments must be carried out to determine the type of training that is required. Generally speaking, health and safety precautions usually include noise, ventilation, lighting, temperature and stress levels to ensure a healthier and safer working environments. For some organisations it is important to have accredited health and safety training courses - which they attend courses to achieve certificates to prove their working environment is safe and healthy. There are health and safety courses specifically designed to help businesses keep on top of the legislation related to maintaining a safe working environment and avoiding accidents. The importance of workplace health and safety training is shown in that statistics show that each year, in the UK there are about 200,000 injuries resulting in a work disability of 3 days or more, and about 2,000 lives are lost through occupational disease or injury. With regards to health and safety practices - performance must come from the top in order to be effective. Both management and employees need to have a collective and individual responsibility for health and safety. Leadership and management health and safety courses guide manager to allow them to successfully implement health and safety policies. Organisational leaders have the responsibility to plan, deliver, monitor and review the health and safety practices. An important area of health and safety is first aid, which St Johns Ambulance believes everybody should have basic skills in. First Aid training courses cover a variety of areas, but usually include life saving procedures, wounds and bleeding, burns and scolds, heart attacks and shock. Like health and safety, regulations for first aid change frequently and employers must keep their employees and workplaces up-to-date. This includes ensuring you have completed risk assessments to determine the number of first aiders necessary for your workplace, as well as the level of emergency first aid knowledge required for your workplace risk environment. 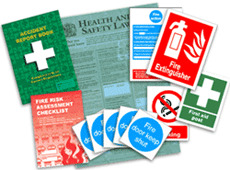 Fire safety is another key area of health and safety that has laws and regulations which employers must ensure their workplace complies with. Most workplaces must complete risk assessments to determine the legislation that affects their industry which includes specifically the fire risks within your working environment. Training courses help delegates put in practice precautions and safety procedures that are necessary to eliminate and manage the risk of fire. Training for the designated fire marshal in your organisation provides the necessary certification to prove that your organisation is taking responsibility for fire safety. Within health and safety, manual handling is an area which affects many professionals, particularly in care industries and heavy duty environments. Training and courses teach delegates the safe ways and methods of moving objects and people to reduce injuries or accidents and are important parts of development.